The Grand Canyon… one of Nature’s wonders! That’s what ads and tour operators will tell you. ...but this is one of those places that you have to see IN PERSON. Descriptions will tell you that it is a great chasm carved over millennia... the Colorado River slicing away at the Colorado Plateau. People will tell you that it has awe-inspiring views. Vacationers and holiday makers will tell you it's a great place to hike or ride the rapids. I guess maybe many of those short term visitors take day trips from Las Vegas... maybe even have a stop at the Skywalk on the way to the South Rim. You can do that and say you've seen the Grand Canyon, but to really see it... you need to savor it..., take your time. Sit and watch the way colors change from reds to purples during different times of the day... Don't these two pictures look different? Watch the clouds cast ever changing shadows on the plateaus and pinnacles. We've visited the South Rim of the Grand Canyon a few times and hiked into it once. It looks different at every time of day and from every angle. 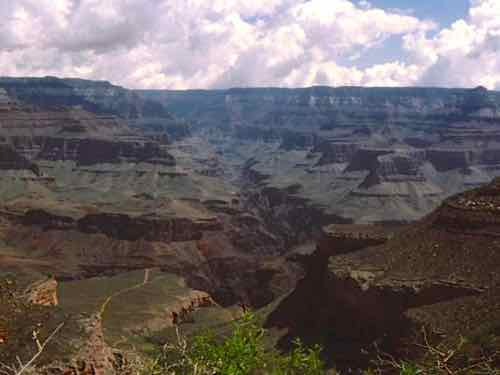 The South Rim of the Grand Canyon is the most visited area and the most accessible. It's the South Rim that we will talk about here. It is open 365 days a year... Services and accommodations are available year round. Just so you know.. Visitor services are only available on the North Rim from mid-May to mid-October. Stay at one of the lodges in the National Park if you can. There are several to choose from, and they range from the historic El Tovar on the rim to more modern motel-like lodges. The rustic Bright Angel Lodge is also only a few feet from the rim. You can easily walk around all day to explore and catch the free shuttles to different overlooks when you want to change the view. 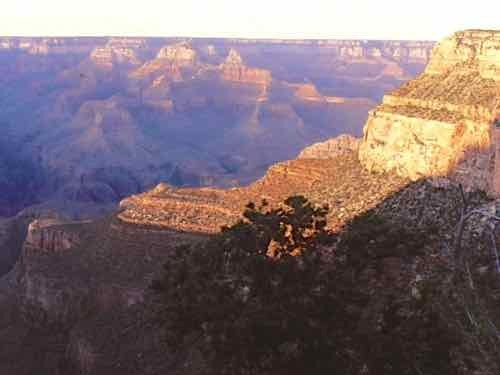 There are campgrounds available on the south rim. If you stay at one of the many lodges and motels in Tusayan 7 miles (11 km) south of Grand Canyon Village, the park provides a free shuttle service from about May to September. You must have a valid park entrance pass to use this. You can hike part way down the Bright Angel Trail for the day. 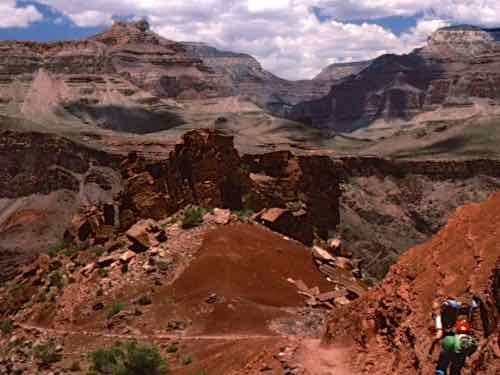 An alternative is to hike part way down the South Kaibab Trail. Markers along the side of the trail tell you how many millions of years old the rocks around you are! Even a day hike below the rim is awe inspiring. Reservations for wilderness permits are required for overnight camping stays inside the canyon. There are campgrounds available on the floor of the canyon with that reservation and back country permit. Permits are popular and should be applied for well in advance, though a small number of permits may be available once you arrive. The first month we applied for our wilderness permits, we couldn't get through to the office.... the phones were always busy. So be prepared that you might have to go with your second choice. The Park Service says that persons arriving without permits may put their names on a waiting list for cancellations. You must pack your food in. There is some food available on the canyon floor at Phantom Ranch. There are also overnight mule trips into the Canyon with stays at the Phantom Ranch. We all wondered whether it was the hikers or the riders who were more sore and tired at the end of the day! Phantom Ranch is the only lodging facility below the canyon rim, and it is run by the National Park Service. There are dormitory type rooms and rustic cabins. Food is also available at the canteen. but PLEASE.... spend more than 20 minutes! Spend a night or two and enjoy one of the world's great natural wonders!